No more compromises. 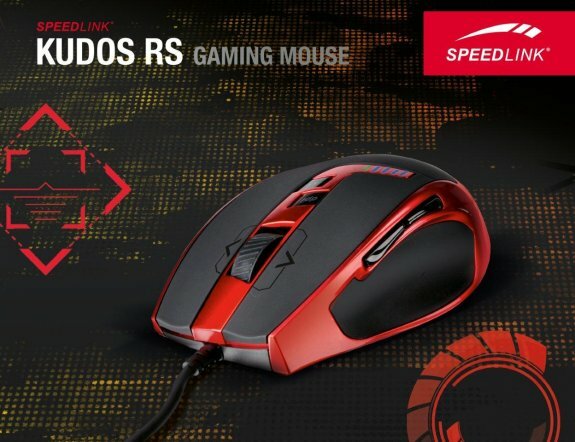 The brand-new SPEEDLINK KUDOS RS Gaming Mouse is everything pro gamers are looking for: rule the match thanks to outstanding ergonomics and optimise the balance using up to six insertable weights. Program seven buttons including the 4D scroll wheel however you like and unleash powerful command sequences using the macro function. The ultra-precise laser sensor is equipped for any situation thanks to its 90 to 5700dpi resolution – plus you can toggle rapidly between five button configs using the profile switch and always know immediately which setting you’re using thanks to the multi-coloured LED indicator bar even in the heat of battle. Low or high-sense gamer, FPS or MOBA: the KUDOS RS is equipped for all types of gamer, any tactic and every genre. That’s not a compromise – rather, it’s the ultimate synthesis of lethal precision, superior speed and customized ease of use. The KUDOS RS Gaming Mouse in metallic red with anthracite-coloured rubberised grips is available now for €49.99 (RRP) from leading retailers.